Jack Brohamer seems like he may be about to cry. I can’t decide if he’s losing a tug-of-war with an acned batboy or if he’s just claimed something along the lines of “I wouldn’t touch that with a ten-foot pole” and is now being forced to test that oath. If it’s the latter, I can’t help but wonder what it is he may or may not touch with his distancing tool. Has George Scott just taken a steaming dump near the on-deck circle? Is manager Don Zimmer showing off the whole body tan he got in the offseason at a nudist colony for people with metal plates in their head? 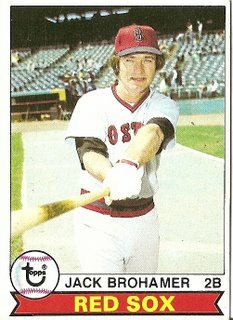 Or is this simply the way Jack Brohamer has come to feel about life in general in the direct aftermath of the Red Sox’ 1978 collapse for the ages? As I may someday be able to expound upon in more detail in another of these letters to decomposing heaven (“gods too decompose,” proclaimed Ken Forsch’s favorite philosopher), my seemingly unstoppable Red Sox squandered a giant late-season lead to the Yankees, recovered in time to force a one-game playoff, took a two-run lead in the playoff game, lost the lead, then rallied but fell short trying to regain the lead. For some reason Jack Brohamer started that playoff game, a weak-hitting left-handed bench guy pitted against the Yankees’ left-handed super-ace, Ron Guidry, who was putting the finishing touches on one of the four or five greatest seasons ever posted by a starting pitcher. No wonder life seemed scary to Jack Brohamer. From October 2, 1978, onward, there would always be a part of me that felt the same way. You are currently browsing the archives for the Jack Brohamer (Bos.) category.